To make a long story short, I was on a diet. Started drinking smoothies with fresh fruits and vegetables. Skin glowed. I’m on to something. Have you ever thought about the benefits your skin gets from daily consumption of certain super foods? I developed some smoothie recipes for younger looking, glowing skin based on experience, results, research and taste. Smoothies are a great way to accomplish multiple health benefits for your skin and body. Easy way to get fruits and vegetables into your diet. Replace them for a meal to keep your waistline trim without sacrificing nutrition. Drink them 5-7 times a week for most dramatic skin care results. No added sugar! Use the sweetness from the fruit to sweeten your smoothie. Choose hemp milk or almond milk instead of cow’s milk. See stats here about benefits of hemp milk vs almond milk. Choose for yourself which will benefit you more. Almond is more available and less expensive and is a good source of Vitamin E (super beneficial antioxidant for your skin.) Hemp milk has some impressive stats for skin, hair and nails but is higher in calories and sugar. No cans! Use only fresh or frozen ingredients. Freeze fresh fruit if you can’t use it all up before it expires. If recipe calls for 1/2 banana freeze the other half. Choose organic fruits and veggies if it’s in your budget. Especially for peaches, nectarines, all berries and spinach. This list from Web Md has great info on what to buy organic or conventional. Smoothies are a great way to use up leftover foods that might eventually end up in the garbage. If you make substitutions & use fresh or frozen you’ll get some nutritional benefits no matter what goes in your smoothies. Go for the Chia seeds. They are a better source of omega 3 and 6. Unlike flax seeds, you don’t need to crush them or process them in any way to receive health benefits. They have 6 grams of fiber per serving and help “sweep” your system. They are pricey but worth the benefits. So far I’ve found the best price at Costco. Include them in smoothies, on top of yogurt, in muffins, on oatmeal or in salads. They are made from: whey, silk, hemp and other plant sources. Choose one according to your dietary restrictions. For a review of Plant Fusion brand see the lifesyle blog of “A Foodie Stays Fit.” Plant Fusion is: dairy, soy, gluten and animal free. Fat helps the absorbtion of fat soluble vitamins like A, D, E & K.
1 peeled and sectioned orange- Don’t use the thick skin between the sections as it doesn’t blend very well and leaves your smoothie not so smooth. Skip all cow dairy in this smoothie! 2 TBSP non-dairy protein powder. For those that are acne prone here’s an article from huffpo from Dr. Mark Hyman detailing why diet and acne are so closely linked. Dust off the blender and don’t sweat it! Just blend it! We are busy people and smoothies are a quick way to multi-task when it comes to skin, nutrition and calorie control. I’ve seen the benefits of smoothies first hand for my skin and I want to hear your results! Is the sun good for us or bad for us? Fact: Sun exposure increases the risk of skin cancer. Fact: Melanoma is on the rise faster than any other skin cancer. Fact: More than 90% of all skin cancers are caused by sun exposure. Fact: Three quarters of the US population has Vitamin D deficiency. Fact: Sun exposure helps us turn cholesterol into vitamin D.
If you’re now confused and frustrated, I don’t blame you. While I may not be able to give you all the answers to the question you now have, I can at least help you make a list of questions you should be asking your doctor or dermatologist. How much sun exposure is safe for you to have. How’s your vitamin D level? Get your moles checked once a year. Vitamin D is essential for strong bones but there is a plethora of diseases vitamin D deficiency can affect such as allergies, asthma, cancer and cardiovascular disease. It is true that we need Vitamin D to keep us healthy and the sun does provide us with this essential vitamin, but sun exposure can increase our risk for deadly skin cancers as well as the number 1 reason for accelerated aging of the skin. Sunscreen is only one step in protecting yourself from sun exposure. Don’t get me wrong, a certain amount of sun exposure is good for you but we tend to over do it and we also forget about the amount of exposure we get from our daily routine. There is no way to get a safe tan. Embrace your natural color or get a spray tan. The WebMD can tell you some affects of the sun on your skin. Wear an SPF 30 sunscreen before you step out every day. Don’t forget the back of your neck, decollete, hands and forearms. Wear a hat if you’ll be exposed for longer then 15 minutes. If you have gotten a sunburn here’s some info that may help. And, I hate to be redundant but get your moles checked dammit. Discussing the sun exposure vs. vitamin D topic with your doctor will put these topic on his radar if it’s not already. Being proactive about your health is important as no one knows us like we know ourselves. Be good to yourself and make the call. I took a product I’m really proud of and that has a following and tinkered with it. Why you ask? I thought it was a great recipe. But I thought it could be better. Sometimes you just have to take a leap and trust your instincts. I’m glad I did…. 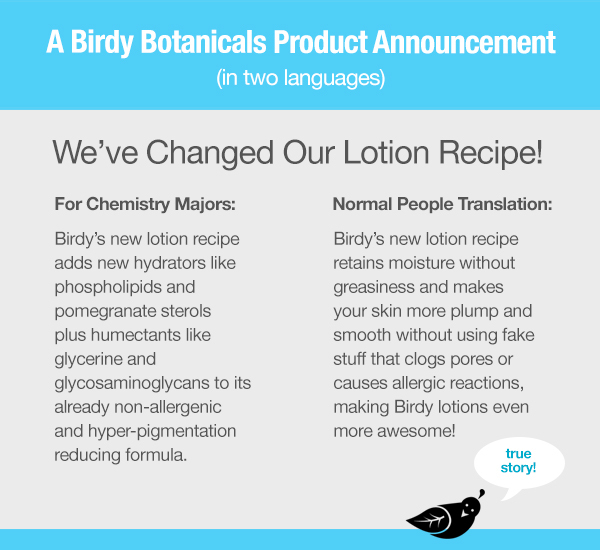 Birdy Botanicals would like to introduce our new 3-in-1 Antioxidant Lotion! New recipe qualifies for the Whole foods premium grade ingredients list. Same great absorbtion. No greasy ickiness. New light formula spreads faster and easier meaning you use less and spend less time applying to face and body. Includes humectants (meaning retains more moisture to the skin) like glycerine and powerful glycosaminoglycans that maintain and support collagen and elastin. Now contains phosopholipids that improve plumpness, hydration and smoothness of the skin. Pomegranate Sterols that hold more then double their weight in water meaning more hydration. This amazing pomegranate ingredient has the same properties as lanolin and petrolatum but without using an highly allergenic animal product or a synthetic ingredient that can clog pores. Jojoba – best oil available for moisturizing without clogging pores. Avocado– high in antioxidants and omega-3 fatty acids. Great for all skin types including sun damaged and mature. Sunflower oils– Contains high amount of Vitamin A that helps hyper- pigmentation and make skin less sensitive to the sun. )Not to be confused with Retin-A – a form of Vitamin A that can be drying and make you more sensitive to the sun. Plant extracts like pomegranate and ginger– serious antioxidants extracts that help fight free radicals from environmental and sun exposure. Licorice helps even appearance of skin tone and lighten skin helping with hyper pigmentation (dark spots) and is gentle on sensitive skin. Still available in 3 amazing scents! Make it all better with one simple step. How do you make the scary face go away?! 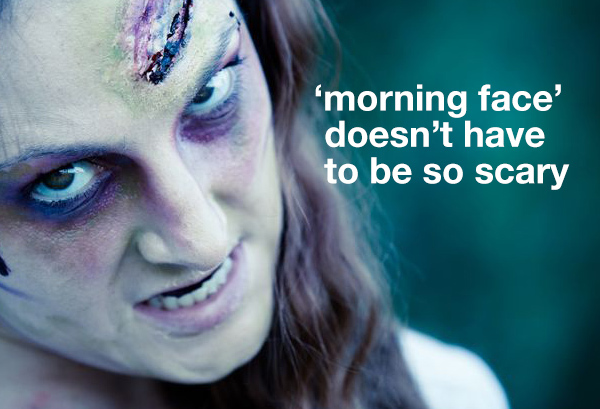 What to do with the puffy eyes and the dry, dehydrated pallor? 3-in-1 Hydrating Lotion Jelly to the rescue! Apply Lotion Jelly as a masque in a thick layer and let it set. Leave on for 5 minutes or as long as you’d like. Go about your business and when you hop in the shower, rinse. Lotion Jelly will hydrate, reduce the appearance of fine lines and de-puff the unsightly eye bags that gives away all indiscretions from the night before. It can undo a multitude of sins. Made with aloe vera, cucumber and a touch of cranberry oil, it’s jelly-like consistency makes for a simple, easy to apply masque. Use it as a masque for your every morning routine if you cleanse your face at night. Perfect for extra sensitive skin. It’s also a light face, body and hand moisturizer. Soothes skin after too much sun, wind or after shaving. Keep it in the fridge and apply cold for extra de-puffing. Use immediately before any event to look your best. Best seller for men and women alike. DIY Dry Shampoo Gets you out of a Jam in a Jiffy! Nicol Frease on Why Blueberries are so Darn Good for your Skin! Hettie Kollos on Why Blueberries are so Darn Good for your Skin! ElenHew on Answers to the Most Frequently Asked Anti-Aging Questions! JeanneJackson on Answers to the Most Frequently Asked Anti-Aging Questions!